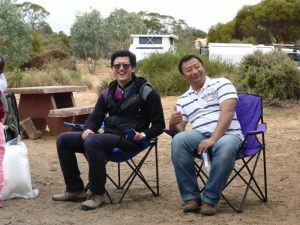 We were very excited, as this was the first weekend trip we would have with the Overland Club. 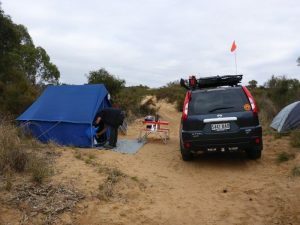 So we packed up our baby tent and the X-Trail – yes – that’s right an X-TRAIL! – and headed out to rendezvous at the Peake post office at around 5pm on Friday evening. So we turned on our radio – tuned to band 24 ..and called. 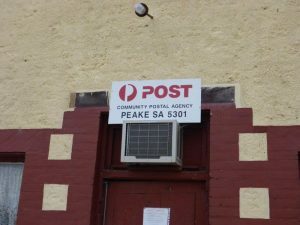 Now the town of Peake is indeed VERY small – so when we couldn’t make connect via radio with the others who had headed up in the afternoon – we were a tad worried – as there wasn’t much to do in Peake to kill time! Eventually Les dragged himself away from hooning around the sand hills and came to lead us in. We set up our tent after hunting round for somewhere that had less rocks and more sand in which to sink our tent pegs! Once done, we joined the others around the camp fire to cook, drink and swap stories. Next morning we woke to a slightly chill morning, but warmed by coffee, we waited for those arriving that day. We prepared our vehicles, by letting down tyres ready for the dunes. Then we were briefed by Steve and Mark re the day’s activities. 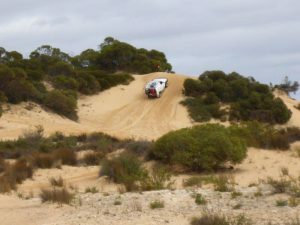 The group split into two – one group of more experienced drivers – who were allowed to go “play in the sand dunes”, and the other – consisting of us newbies with a few experienced ones who were there as advisers- generally to make sure we came out safely at the other end! Jim was in the experienced group and kindly rolled his tyre so the group spent a bit of time recovering his vehicle. This kept them busy there for a while, and also back at camp, where they took the tyre off the rim to clean out the sand. Our group, led by Steve and Mark, followed with blind acceptance over the sand dunes, relying on radio contact for warnings “NOT to follow yet”! 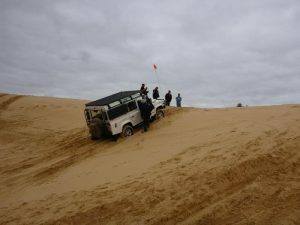 It was a really great experience, and even though some of us had our eyes closed at some points (hopefully only when passengers), it was a comfortable way to get used to the feel of the dunes and to see how well our vehicle would cope. Alan found out that he needed to turn off the stability control on the X-trail, because it kept engaging the brakes on the spinning wheels as he travelled across loose sand. This meant we stopped, and had to back down the hill and have another go. We headed back to camp for lunch around the camp fire, and prepared for the afternoon’s adventures. We had the pleasure of Rick’s daughter Luna, adding a child’s perspective to the afternoon. She really enjoyed playing in the sand hills, and was thrilled to find tiny shells revealing the origins of the inland seas from long ago. After lunch things became serious! 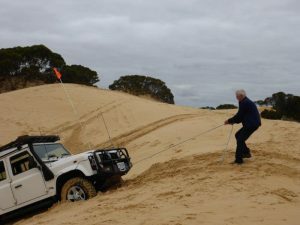 Some folk were doing their recovery training and marking off their achievements in a log book, while Mark and Steve took our group out for more sand and rock driving. Mark had been encouraging us ‘newbie ladies’ to take the wheel, so I took over driving. Things went well over the rocky ground, but it only took seeing Steve’s Range Rover Discovery sliding slowly sideways down a slope to encourage me to jump out and hand the driving to Alan. Small steps!!!! 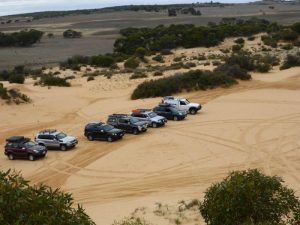 Our group practised driving over dunes of varying complexities, with all vehicles performing in different ways. It was a relaxed group, knowing we had people who could offer advice, so that we learnt about recovering our vehicles safely. Some of our number returned home that afternoon as they had only planned a day trip. The evening once again was a highlight, with the draw of a camp fire and some of the club port adding to the ambience of the evening. It is a great time to swap stories about other Club trips, and gather valuable tips on travelling out bush from a great group of travellers! We were able to stargaze once again, before folk retired to tents (sigh) or campers and caravans. Next morning, bright and early – we headed out for more driving. This time we were led by Les who sounded very much like he knew what he was doing! 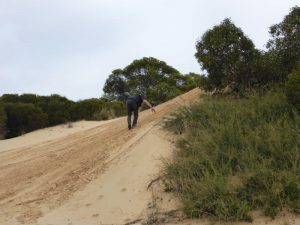 We followed him with lots of confidence – we first met a steep sand dune – Alan got the X-trail over with no problems, but Damien had quite a few tries – we had fun clambering up and over the sand dunes taking pics and watching the progress. We appreciated Les’ expertise as he guided Damien through this, and he finally achieved his goal. 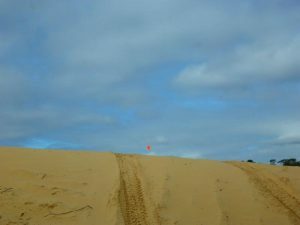 After more driving, Steve wanted to practise using his sand anchor, so he purposely drove his Discovery into a dune. Adrian, Steve’s son, headed over the hill to secure the anchor – unfortunately, Steve had to deal with a flat battery in the remote. Once that was sorted, we waited eagerly to see the magic of the anchor work… except it just ploughed through the sand – but made no impression on Steve’s vehicle! 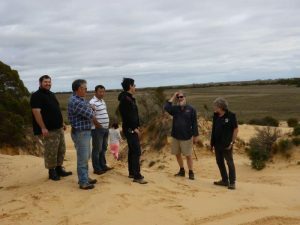 Eventually we abandoned him to dig his car out, and followed Les – who managed to drive up a dune buggy track and got bogged! He told us to wait – so we waited – and waited! 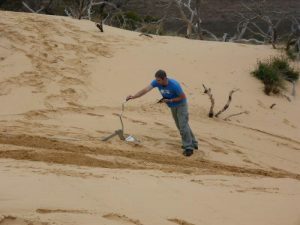 Steve and Adrian caught up with us – then headed to camp – we waited some more and saw Les’ sand flag in the distance – but it took a while for him to get back to us – then began the farce of trying to get back to camp – his GPS tried, but it didn’t really understand sandhills! Eventually we got back to camp – but had missed the demonstration of using the air jack and high lift jack! 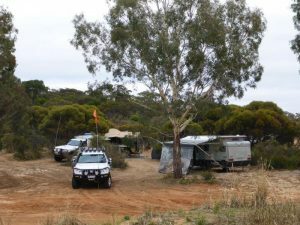 The Peake adventure was drawing to a close, so we lunched and packed up, most of us leaving for home hopefully with some 4WD knowledge under our belts. I’d like to thank Steve N and Mark W for the trip organisation and training. The rest of the regulars were once again welcoming to the newcomers, making it a great trip and a good way to get to know members of the club. 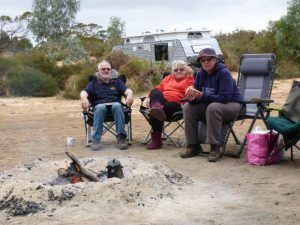 Thanks to Viv for handy camping tips, Mark W for hints on how to mouse proof a camper, Elaine for yummy healthy treats and recipe swaps and Eileen for bringing Penny for us to fuss over! If you haven’t been to Peake, I would thoroughly recommend that you make the trip!